STAR TREK: GENERATIONS (Paramount, 1994). 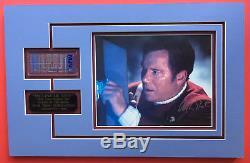 WILLIAM SHATNER -- JAMES T. Screen Used Prop & Signed Photo. 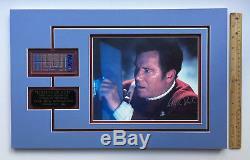 USS ENTERPRISE B "ISOLINEAR CHIP" & Photo Boldly Signed by SHATNER. Pictured with Actual Prop in Key Scene from STAR TREK Theatrical Release. 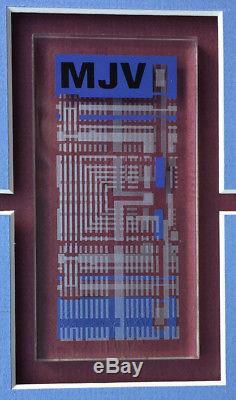 Visit YouTube To View James T. Kirk & This Very Isolinear Chip Together. In The Epic Original Hi-Def Segment From "Star Trek: Generations". 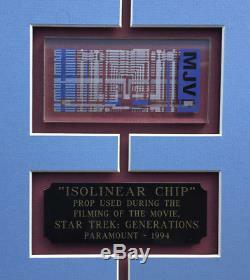 This is an actual "Isolinear Chip" used in the production of STAR TREK: GENERATIONS, starring William Shatner, Patrick Stewart, Brent Spiner, LeVar Burton, Marina Sirtis, Jonathan Frakes, Gates McFadden, Michael Dorn, and Malcolm McDowell. The prop is matted along with an 8x10 full-color still featuring Shatner in STAR TREK: GENERATIONS with the actual prop. 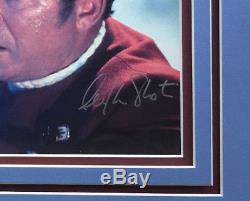 Boldy signed by William Shatner in silver ink. Entire item measures 12 1/4" x 19". Isolinear Chip measures approximately 2" x 4". Signed photo measures 8" x 10". Includes full-color, detailed Certificate of Authenticity issued by BlackSparrow Auctions, featuring image of item, signed and dated by BlackSparrow president. Photo of Certificate of Authenticity is partially redacted here to protect key information and prevent unauthorized duplication. All photos were taken without flash. Item will be professionally packaged and insured. 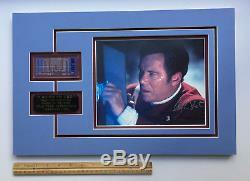 The item "STAR TREK - SHATNER / KIRK SCREEN-USED ISOLINEAR CHIP PROP & AUTOGRAPHED PHOTO" is in sale since Wednesday, October 31, 2018. This item is in the category "Collectibles\Science Fiction & Horror\Star Trek\Other Star Trek Collectibles". The seller is "americanoxford" and is located in New York, New York. This item can be shipped to United States.